The MDC Comfort Stirrups® are a revolutionary new stirrup design that positions your stirrups where you want them. You select any of three preset stirrup positions: traditional, 45 degrees or 90 degrees. The preset angle improves leg, calf and foot position, relieves pressure on hips, knees, ankles, and back, and reduces leg burns. The MDC Intelligent Stirrups® are easily retrievable, making your performance more precise and much safer. MDC Comfort Stirrups® have earned top praise, including Horse Journal Magazine Product of the Year and endorsements by many top riders including the entire US Dressage Team, Phillip Dutton, and Margie Engle. WEG Show Jumping Silver Medalist Beezie Madden says "They're simply amazing!" and Debbie McDonald says "I would recommend these stirrups to anyone at any level of riding." Footbed Width: 4.25", 4.5", 4.75"
Traditional solid foot plate. 4¼", 4½" or 4¾". Stirrup pads only available in grey. Footbed Width 4.25", 4.5", 4.75"
Special Features Rotates 45 and 90 degrees, or traditional angle which improves leg, calf, and foot position. Relieves pressure on the joints and reduces leg burn. 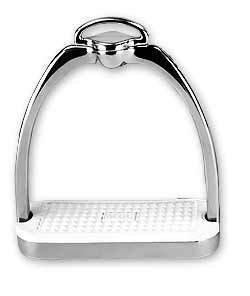 MDC Comfort Stirrup is rated 4.8 out of 5 by 19. 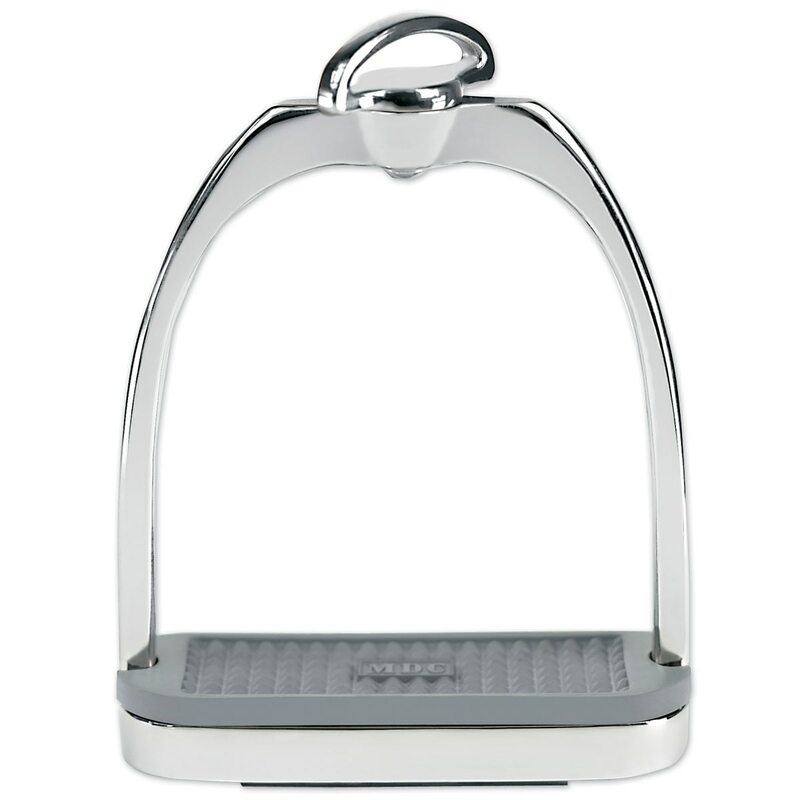 Rated 5 out of 5 by Nibbler from Difference is Amazing This is my second pair of MDC stirrups. I didn't think setting the swivel would make a great difference but is does. My knee pain is gone and it's just so much easier to catch a lost stirrup. I also like the heavier weight of the stirrup. I would definitely recommend them. While pricey they are worth it. I still have my first pair which I purchased at least 5 years ago. They look good as new! Rated 5 out of 5 by Leslie from Comfortable These stirrups are nicely heavy and easy to pick up with your toe. Rated 5 out of 5 by Hoxy from Helpful and Hefty Have been using the MDC Comfort Stirrups for about a month. The first time I used them I liked them. They are heavier than my fillis stirrups and I like that. It makes them more stable. The MDC Comfort Stirrups are longer with the added piece at the top, so I had to shorten my stirrup leathers by a 1/2" hole. I bought them to help prevent rubs, especially on my right leg, and it has been working. I twist them to the 45 degree angle and then, twist them back when am done. Rated 5 out of 5 by Cindyr from Worth the money I have degenerative changes in my left hip that make it difficult for me to keep my left lower leg on the horse. My calf and toes like to point out. These irons at the 90degree position have improved my leg position tremendously. Rated 5 out of 5 by Araion34 from Outstanding stability Love these stirrups! I am back riding after knee replacement surgery. The hinged tops make for a painless ride. Adds superb stability, and takes the pressures off your knees. 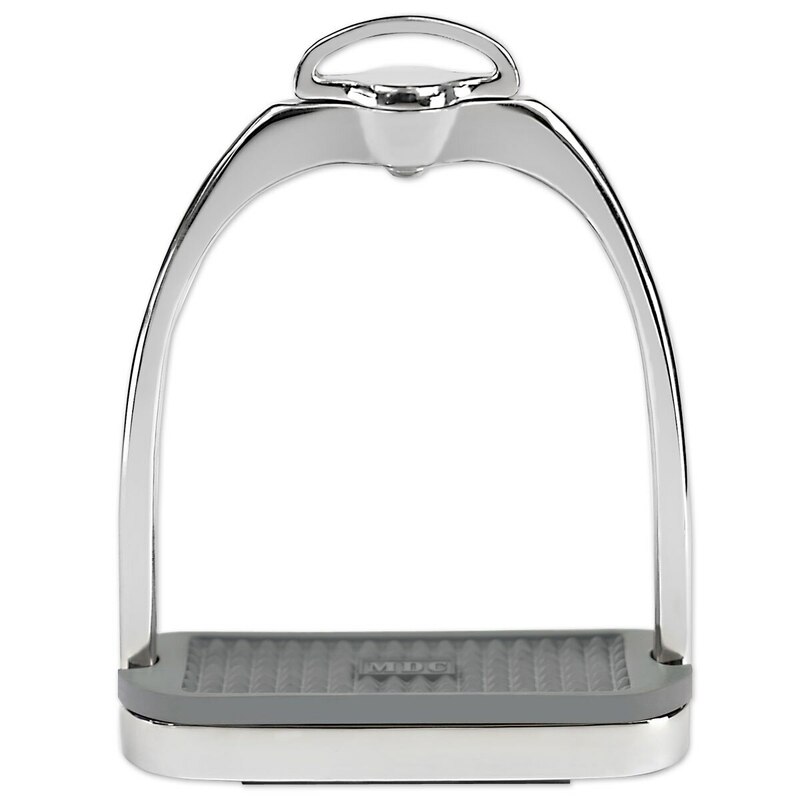 Rated 5 out of 5 by Barnista from So Practical I purchased these stirrups about four months ago. I absolutely love them. They have a great weight to them-which is important. I have knee and hip issues stremming from a skiing accident, and I can't say enough about the ability to change the flexion of the stirrup- just one strip if needed! I will at times change it for one purpose and then change it back for another purpose -inside to outside leg work/canter to trot depending on pressure/driving seat and day! I can change the position of the sturrrip in the saddle, so easy! My trainer who has no strains, wants a pair for herself. The idea behibd this product, that you can ride in a normal position, change if needed to work on the specific skill, or to reduce strain to keep yourself in the saddle longer, is just awesome! Rated 5 out of 5 by Grace from Longer Leg Loved how easy these are to use. I feel like my knees are more comfortable and I feel like it's easier to have a longer more relaxed leg. Rated 5 out of 5 by ebpabigd from the best!! 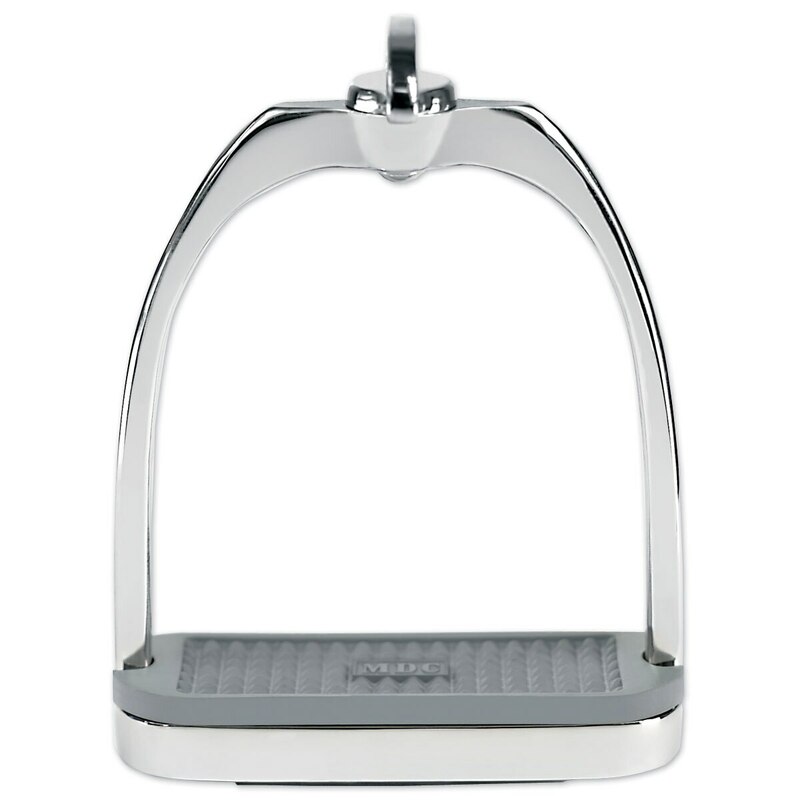 These stirrups are simply the best - the highest comfort combined with well made/solid construction. I have knee problems and being able to dial in the angle helps reduce strain on my knees and hips and supports correct alignment. 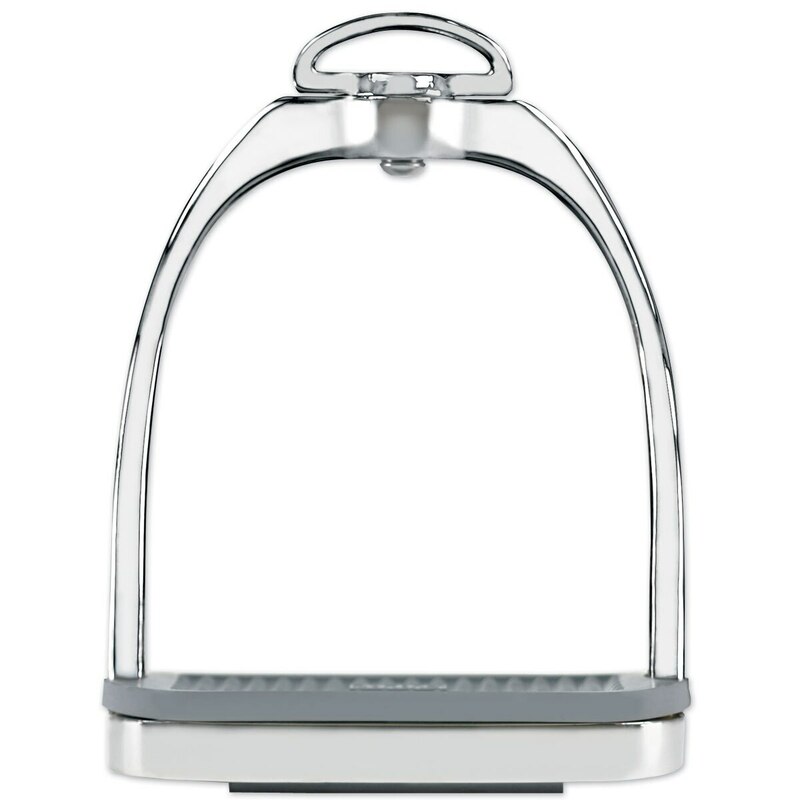 Rated 4 out of 5 by Carolyn from I have only used these stirrups a few times but so far I really like them. I do think they help me keep my leg in a more correct, relaxed position. I love that they are weighted, and now I just have to remember to rotate them before I mount. All in all I like them - they are a definite step up from plain straight irons. Rated 5 out of 5 by Kittles55 from helps with leg position This is my second pair - my daughter stole my first pair! I love these - they help position my leg and also much easier on my knees in the 90 degree position!